Education Advanced Master of Science in Orthopedic and Sport Physical Therapy in 2007, Quinnipiac University Bachelor of Science in Physical Therapy in 1998, Quinnipiac College Certifications Board Certified Orthopaedic Specialist (OCS) Graston Technique® Certified Myofascial Trigger Point Therapist (CMTPT) Titleist Performance Institute Certified Golf Instructor and Medical Practitioner (TPI MP3) Functional Movement Screen (FMS) Selective Functional Movement Screen (SFMA) Certified Kinesio Taping Practitioner (CKTP) Clinical Specialties Orthopedics, sports medicine, myofascial release techniques, functional movement, pre and post surgical rehabilitation, and golf conditioning and rehabilitation. Education Doctor of Physical Therapy in 2016, Springfield College Bachelor of Science in 2014, Springfield College Certifications Hawks Grip Instrument Assisted Soft Tissue Mobilization Clinical Interests Orthpedics and sports medicine, with a focus on “overhead” athletes, including baseball players, swimmers and football players. Outside of the clinic… Bryan loves spending time with his fiance and enjoys time on the ocean. He loves Boston sports and hanging out with his dog Chief, a golden retriever. Education Doctor of Physical Therapy in 2013, Springfield College Bachelor of Science in Physical Therapy in 2011, Springfield College Certifications Board Certified Orthopaedic Specialist Graston Technique® Certified Myofascial Trigger Point Therapist (CMTPT) Clinical Interests Orthopedic, post-operative rehabilitation, and myofascial release techniques. Outside of the clinic… Meagan enjoys running, snowboarding and boating with family on the weekends. Education Doctor of Physical Therapy in 2017, University of Hartford Bachelor of Science in Health Science in 2014, University of Hartford Certifications Graston Technique® Level M1 Clinical Interests Orthopedics, sports medicine. and has a passion for treating equestrian athletes. Outside of the clinic… Molly loves to sing and play the guitar, and she has been riding horses since she was six years old! A self-proclaimed diehard Boston sports fan, Molly cheers for the Red Sox, Bruins and Patriots. Education Doctorate in Physical Therapy in 2016, Duquesne University Bachelor of Science in Health Sciences and Biology in 2014, Duquesne University Clinical Interests Erik is clinically interested in chronic pain management, as well as helping athletes return to their sport with sports rehabilitation. Outside of the Clinic… When he is not treating patients at PTSMC, Erik enjoys participating in triathlons, finding new trails to hike, golfing, water skiing and traveling to new destinations. 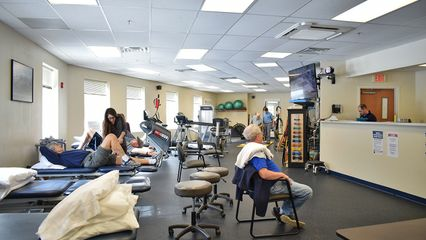 Education Doctor of Physical Therapy in 2018, Arcadia University Bachelor of Science in Health Science Studies in 2015, Quinnipiac University Clinical Interests Mary’s clinical interests are musculoskeletal dysfunctions, joint replacements and post-operative rehabilitation. She really enjoys working with patients who have Parkinson’s Disease and Multiple Sclerosis. Outside of the clinic… Mary enjoys weightlifting, calisthenics, boxing, kickboxing and yoga. She also has over 30 succulents and plants at home!